All fish are not created equal. For that matter all marine life is not the same. I suppose that's what makes movies like Finding Nemo and Dory and SpongeBob SquarePants work. Lots of characters to be had there. 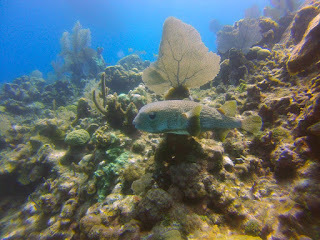 Our recent dives have provided lots of fishy personalities and I'm not referring to divers. That's a whole other observation. We all have our quirks. There has not been one grouper that I've met, large or small, that looks happy. No matter the size (and we've seen some whoppers) they always have a turned down look to their mouths that look like a frown. Grumpy groupers. The exact opposite is the colorful parrot fish. Its mouth is shaped more like a smile and it literally bounces around the reef from rock to rock gleaning what it can from each. 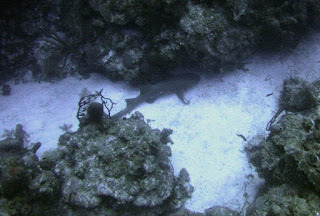 Seemingly hyperactive they skip to another section of the reef and continue to happily scrape their favorite tidbit of vegetation from the rocks and hard corals there. In between these two personality types are all sorts. There's the "dead-eyed" barracuda who makes you shiver with his look as he slowly circles you to see what you are up to. Then it's the trigger fish with their eternally puckered mouth as if they've eaten too many lemons. All sorts of jaw fish in the sand pop up and down and amaze me at the way they can back into their hole without looking. The puppy dog eyes of the porcupine fish make you want to cuddle them although that would not be wise. Then there are the schools of yellow striped grunts and blue fish (whose name escapes me). When the sun lights them up it looks like a party not a school. They seem to be the more social groups. Now you might think that the shark would have an outstanding personality but actually with all the sharks we've seen I'd have to say they were the most shy of all the sea creatures we've met. They appear quickly and disappear just as fast, rarely hanging around long enough for a picture. It's a whole different and amazing world beneath the surface. What Would You Book - A B&B Or A Hotel? Hmmmm. What To Wear? What To Wear?